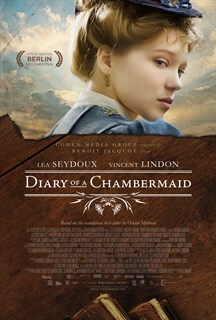 Diary of a Chambermaid is available on DVD, Blu-Ray™ & Digital HD. Watch it today HERE! Léa Seydoux follows in the footsteps of Paulette Goddard and Jeanne Moreau as Célestine, a resentful young Parisian chambermaid who finds herself exiled to a position in the provinces where she immediately chafes against the noxious iron rules and pettiness of her high-handed bourgeois mistress (Clotilde Mollet), must rebuff the groping advances of Monsieur (Hervé Pierre), and reckon with her fascination with the earthy, brooding gardener Joseph (Vincent Lindon). Backtracking past the fetishism of Buñuel’s version to Octave Mirbeau’s original 1900 novel, Benoît Jacquot has one eye on contemporary France: the sense of social stiflement, Célestine’s humiliating submission to Madame’s onerous terms of employment, Joseph’s virulent anti-Semitism. But the turn-of-the-century setting saw the rise of Freud ideas about the human unconscious and so Jacquot takes care to look past the characters’ outward behavior and appearance to the repression and compulsions that lie behind.